I’m making this drink in partnership with Orchid Cellars in Middletown, Maryland. Opened in 2010. They’re a first generation polish family creating new mead recipes inspired by Poland’s long and distinguished mead making history. Blacksmith is a mixed berry mead that is barrel aged for eighteen months. This a full bodied mead with big honey notes. Very polish. If you’ve tried other polish style meads and liked them you will like Blacksmith. 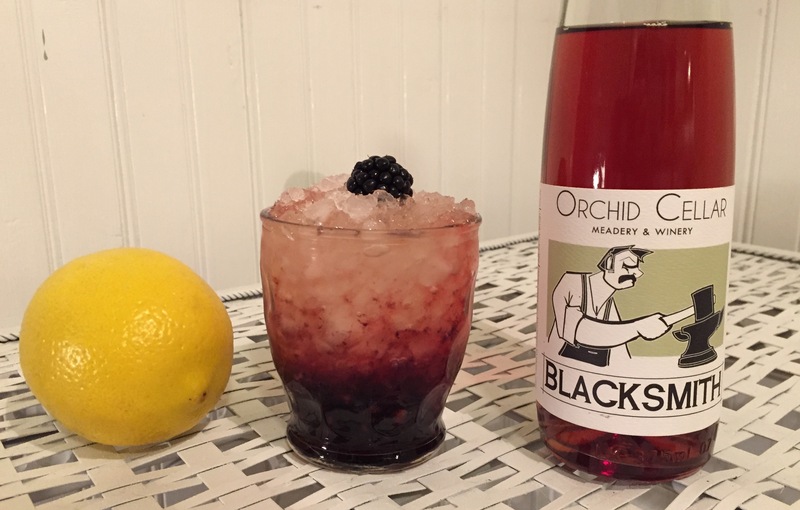 It’s blackberry season and I’m becoming intrigued with old timey cocktails like brambles. The name bramble itself sounds fun and charming. My recipe is an adaptation of the blackberry bramble from Food Republic. I was surprised by how all the other elements of the cocktail served to bring the mead to the center. It’s very refreshing and with great honey flavor. In another shaker, combine gin, mead, lemon and simple syrup. Shake briefly to combine. Combine a small splash of the drink mixture with the blackberries and pour into a glass. Fill the glass with crushed ice and pour the rest of the drink over the ice. Enjoy! This entry was posted in Bramble, Cocktails, Gin, Mead and tagged blackberries, bramble, cocktails, gin, mead on September 12, 2015 by meadmixologist.